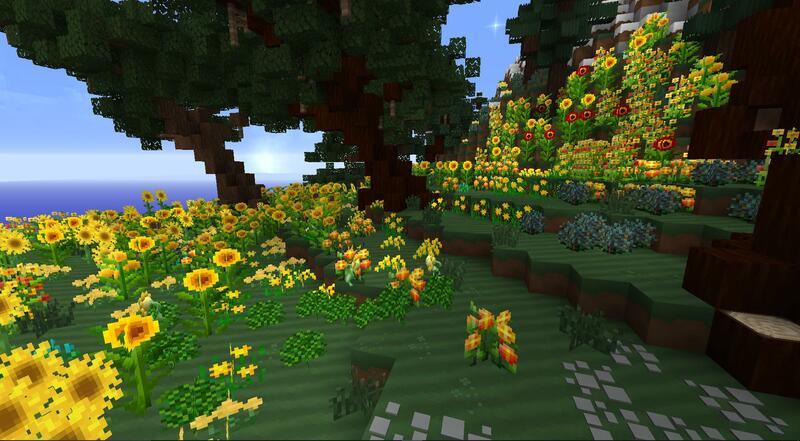 Adds over 110 beautiful flowers to your Minecraft World! Make beautiful gardens or just enjoy the colorful surroundings. Flowers are great for any sort of decoration and colorful building blocks make great accent blocks. Light blocks are also included to make it easy to build nice structures with hidden lighting. 32 new dyes, dyed brick blocks and slabs. 16 new glass and glass pane colors. Light blocks- some Vanilla blocks can be crafted into light emitting blocks similar to Glowstone. 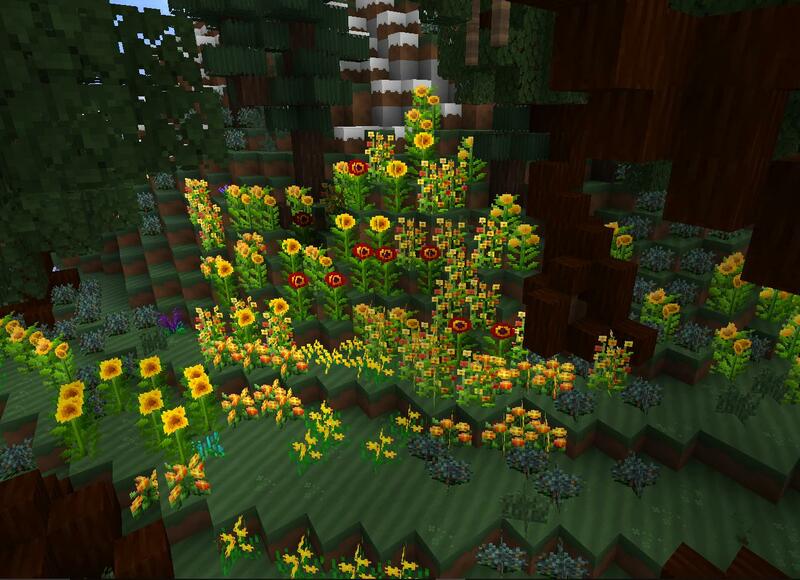 -Flowers generate based on biomes. -Flowers generate in mixed groups of different flowers. 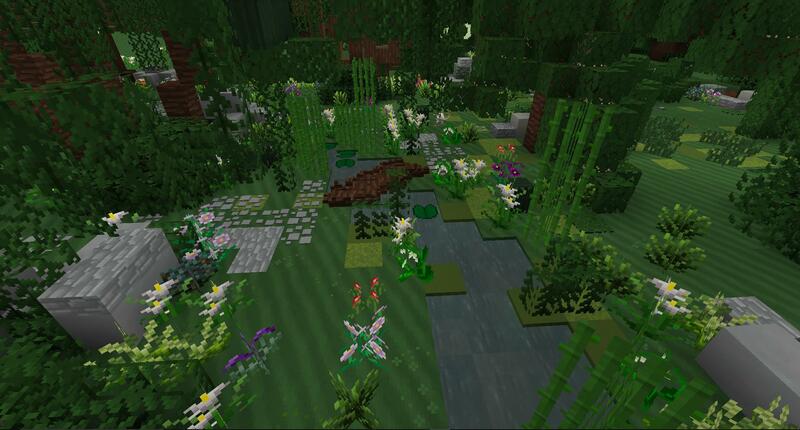 -Most of the flowers will generate in more than one biome. 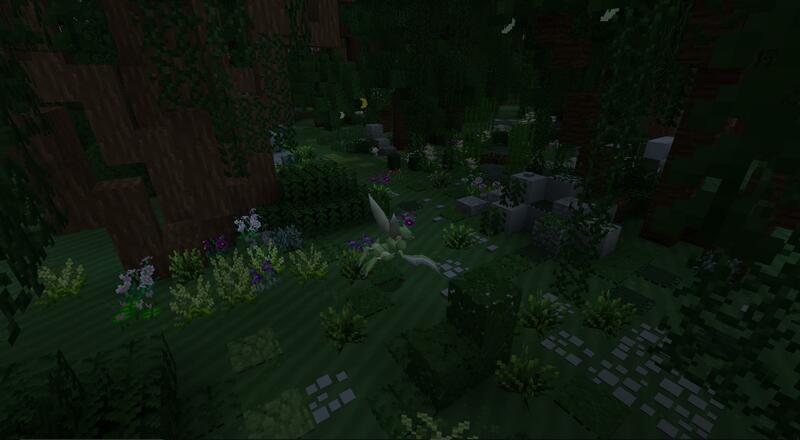 -Mountain, Swamp & Jungle biomes have a few unique flowers that only generate in those biomes. -Desert, Savanna & Mesa biomes have a unique set of flowers that are native to hotter climates and only generate in those biomes. -New Sweet Peas- craftable flowers with wooden trellis. -New Flowers and more recipes for the dyes. -New Configs- more control of flower generation, bonemeal small flowers and much more. -New Flower Chest- holds all of Ferdinand's Flowers' blocks and items. Only holds FF's items, unless specified in the Config- with config to add Vanilla and some modded, plant related items, like sapplings and seeds etc (off by default.) Craftable with Any FF's Double Tall Flowers. Has 108 Inventory Spaces. what flowers are in each of the Config's Flower Groups. These groups are also now shown in the Configs. 'the Story of Ferdinand' is a children's book that I loved when I was young. 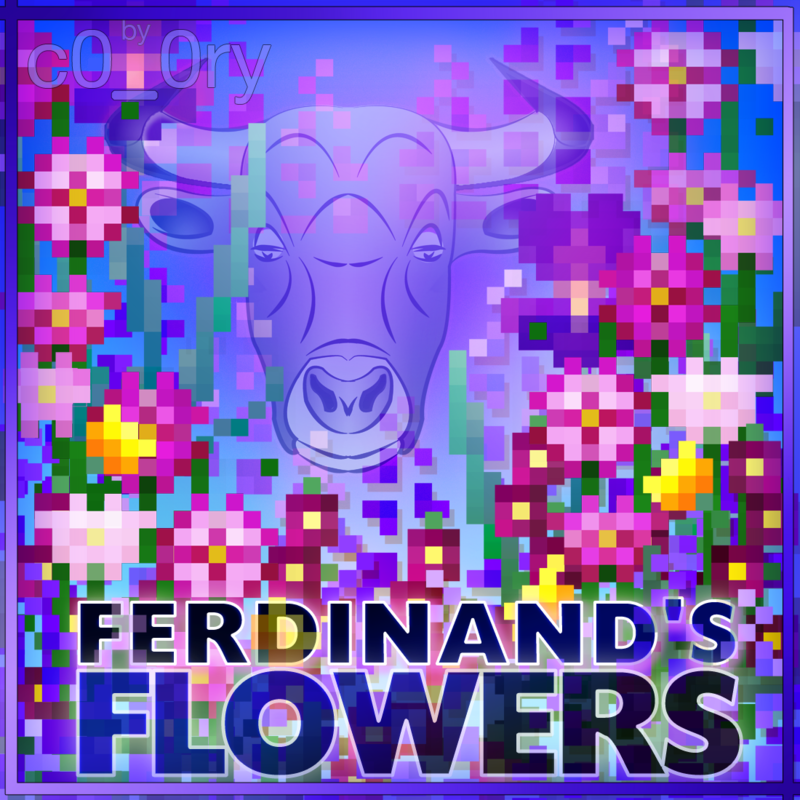 The main character is a bull named Ferdinand that "liked to sit just quietly and smell the flowers." You may use this mod in your mod pack. Please do not repost to other sites. I love your mod. Thank you a lot! I have a question: Does your mod is compatible with https://minecraft.curseforge.com/projects/ore-flowers and https://minecraft.curseforge.com/projects/pams-weee-flowers ? I mean does your mod will let a chance for the other mods flowers to naturally spawn during the world generation ? yes my mod lets other flowers and plants spawn normally. i havent tested it with those two mods, but they should all work together just fine. there shouldnt be any problems. Oh. Perfect. Thank you a lot. I can't wait to test your awesome work on my server :). Just more pictures! I love this mod ♥ ♥ ty again for it! This mod is so beautiful, but I'd love to use it in a void world that doesn't allow for normal worldgen. Any possibility of getting a seed variant for the flowers? I'd suggest seeing if there's a retrogen mod that could help you out, or to use commands/jei/nei to give yourself the flowers you want and plant them. I don't think I've seen a built in retrogen option in the config for this mod. Hey there, your flowers are really pretty. I love the aesthetic! I had a few questions if you don't mind... Is it possible to create flower vines? I love putting small gardens on top of my house and would love to have some flowering vines flowing down. Also...I love flower crowns! :P I would love to be able to make one from your flowers. hi, sorry this is so late..i really like the idea of having flowering vines.. and the crowns... i added your ideas to my list of to-dos and will try and at least add flowering vines for the next update. not sure when this will be, but i think the vines and crowns would be great to add. thank you for the suggestions! Here's some ideas/stuff I'd love to see! a version of Clover that doesn't have the cute flowers. A bonemeal that spreads your type of flowers? Anyways, ty for the mod and keep up the good work! Thank you very much!! i love the pics! thank you for showing them. it is really awesome to see how you use the flowers in your world. Nice ideas! I will definitely add the clover with no flowers. i bet it will really add to the way they look when they are grouped together. Lily pads are in the works, maybe for the next update, but i havent quite gotten their coding figured out yet. and cattails would be awesome too. i will definitely add them to my list of 'to dos'. i made some textures for them a long time ago but then forgot about them ... glad you reminded me lol. a bonemeal for just FFs is a really good idea as well. i think it may be a good solution since the regular bonemeal would still just give vanilla flowers. No worries about the wait! It's just cool that you replied at all <3 Makes me love the mod all the more :3 ~ Good luck with all the coding and everything, cheers!